Just a few weeks ago I discovered the Stainless browser which I have used almost incessantly ever since. And I haven't been disappointed. It's a wonderfully light, fast, easy to use browser with none of the extra baggage that many browsers think are indispensable nowadays. 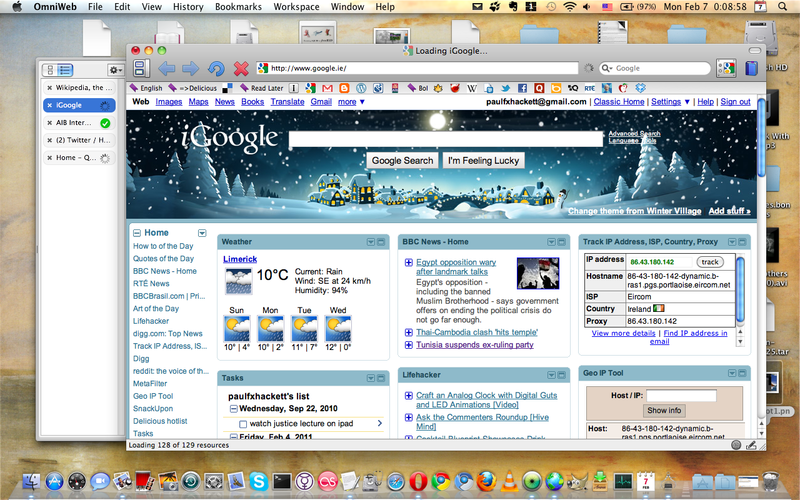 Well, now I've come across yet another light and fast browser of the Mac called OmniWeb (I'm using version 5.10.3). What a pity it has to compete with Stainless and is only available for Mac. It has a great bookmark system where favorite sites can be represented with favicons in the horizontal bookmarks bar. Additionally, a few of the bookmark favicons actually "lost" their icons and reverted to the default. However, this was readily reversed by clicking on the favicon once or twice. OmniWeb uses tabbed browsing, an essential for me, but in a slightly different way. The tabs, instead of appearing towards the top of the page, actually show up in a drawer that slides out from the side of the browser (see screenshot). Now this took a biot of getting used to but now I quite like it. It's also very convenient that links and bookmarks can be opened just by sliding them into the tab drawer. One thing I missed in Stainless, and which kept me using Opera for a very long time, was a great RSS system. Well, OmniWeb has s system that easily matches that of Opera. There is a very explanatory set of short videos which show all the key features of OmniWeb and this is well worth a look. Ironically, these videos did not play well for me in OmniWeb and I had to resort to Stainless to see them in their full glory. Perhaps this has to do with a preferences selection that I've yet to discover. I cannot believe they would produce a video about their browser that doesn't actually play well in their own browser! While Stainless cannot handle the addition of an image to Blogger blogs like this one, OmniWeb handles this with ease. So which will I use? For the moment, I still prefer Stainless but I'll use OmniWeb for the RSS feeds. But, it wouldn't take too much to swing me either way. Time will tell. Edit (8/02/2011): I posted to the OmniWeb browser forum to see whether it was possible to change out the ugly default favicons in the bookmarks bar for favicons downloaded from the web. Seems you can't for the moment anyway. Here the post. Well, I'm still using OmniWeb but I'm not sure I feel quite as comfortable with it as I did with Stainless. OTOH, what it has that Stainless doesn't is a very nice RSS feed system and it comfortably handles image addition to Blogger posts. But it may be that I'll go back to Stainless soon.